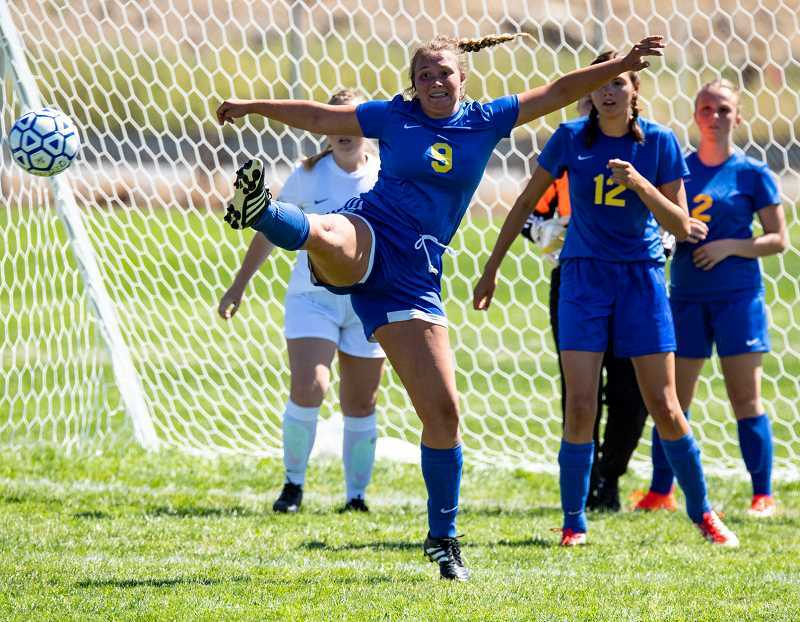 The Crook County Cowgirls and the South Albany RedHawks were both tentative early in their season-opening soccer match Tuesday afternoon in Prineville. Not only was it the first game of the year, but both teams had missed some practice time because of heavy smoke the previous week. Crook County had a couple early scoring chances, but both times the RedHawks goalkeeper was up to the challenge. Then, approximately 10 minutes into the first half, the momentum shifted as the RedHawks were able to take the ball deep into the Crook County end of the field, putting pressure on the Cowgirl defense. After a pair of corner kicks, the RedHawks finally broke through as Adreana Whitebird drove a ball into the back of the goal. That's the way that the score stayed until late in the first half. 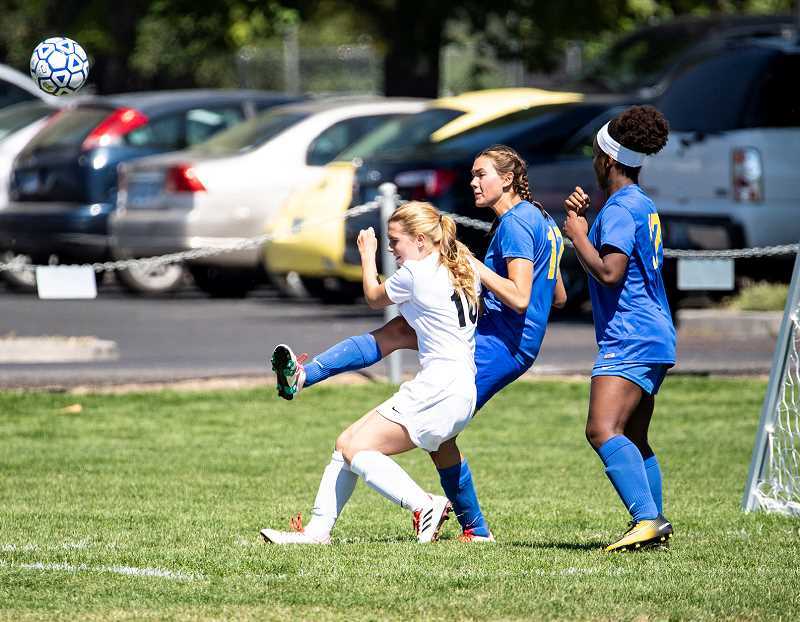 Then, with approximately three minutes left in the half, Birdy Marchand scored a second goal for the RedHawks after the Cowgirls were unable to clear a corner kick out from in front of their goal. Thirty seconds after her first goal, Marchand scored again, making the score 3-0. Then McKenna Platt scored on a direct free kick from 30-meters out with just seconds remaining in the half to give South Albany a 4-0 lead. That was more than enough cushion for the RedHawks, who were in total control the remainder of the game as they rolled to a 9-0 victory. "We need to learn not to get down on ourselves," senior defender Emma Hehn said following the game. "I think there was a chain reaction as soon as the first goal was made. Then there were three goals in three minutes at the end of the first half." Whitebird scored her second goal of the match just 30 seconds into the second half, and the route was on. Marchand and Platt each ended up with three goals in the contest, while Ambri Burton also scored for the RedHawks. "We are trying a new system this year, and we haven't even had a chance to try it out in practices because of the smoke," Crook County head coach Rich Abrams said. "Losing the jamboree last week hurt us, but you know, it was good. I got to see what we need to work on and identified a few key points." Abrams added that the team was going to work on addressing those problems in practice on Wednesday, before traveling to Madras on Thursday to take on the White Buffalos. "We will take tomorrow to sort a few things out with the team," he said. "Some key players are new to the team, so you know, we will get there." Hehn added that she believes that the team can correct their mistakes and that the key to getting future victories is their confidence level. "We are just going to keep working," she said. "We will work on getting more confident and getting better with knowing who is on who on defense and knowing when to push up and when to pull back." On a more positive note for Crook County, the Cowgirls and RedHawks played to a 6-6 tie in the JV game. Following Thursday's match at Madras, the Cowgirls will host Dallas on Tuesday, Sept. 4, in a 4:30 p.m. match. The team will then have a week to prepare before hosting La Pine on Tuesday, Sept. 11, also at 4:30 p.m.